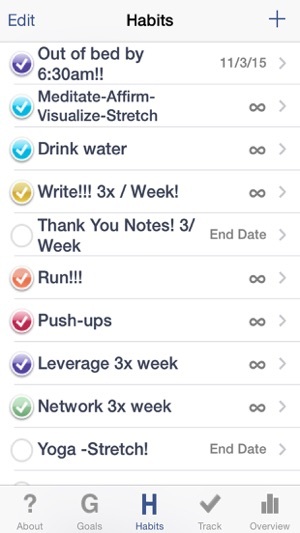 I’ve tried many goal tracking apps and I always come back to Habit Factor. My main criteria for rating an app is: does it do what it’s supposed to do without a lot of fuss and irrelevant bells a and whistles? This one does. Update: Wow! Equilibrium has been hard at work! Thanks, I'd write a review, but it'd be just reiterating the beautiful points on the app description. As long as your goal app is fun to use, and you can focus, you can't do much better than that. Thanks Equil-Ent! Sep. 09: I maybe jumping the gun, but v1.5 which seems to address my previous issues isn't on the app store yet.. I added a star for good luck. Aug. 09: Until this app can mark a badge for items due for that day only, this is a three star app. I suggest touch Goal, for that. 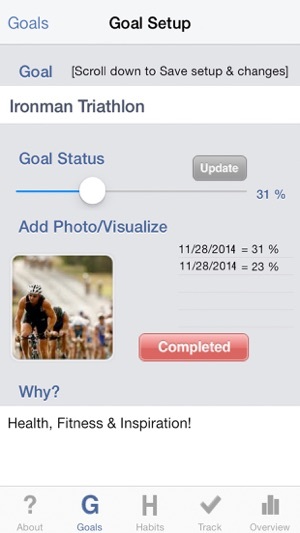 What this app does better than touch goal is make it attractive to track goals. Touch Goal is more functional. These are great competitors, but Touch Goal is the Flagship app, an example would be a Bomber (Touch Goal) vs. a Fighter Plane( Habit Factor). The Bomber will get the job done, but what's the fun in that? The Fighter plane is fun to fly, fast, but needs more precision. Without the added functionality of being able to set in the badge the items due for the day, Habit Factor is like a Fighter Plane without any missiles. You can get by, maybe, but eventually you're gonna want to ditch the app. Please release a Habit Factor Pro if you need motivation to purchase to develop this app, it's beautiful and fun, but it has a fatal flaw. 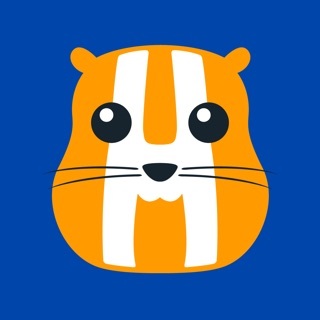 This app is a great idea with sub-par implementation. The biggest problem stems from the confusing way in which one must tell the program that the daily habits have been done . 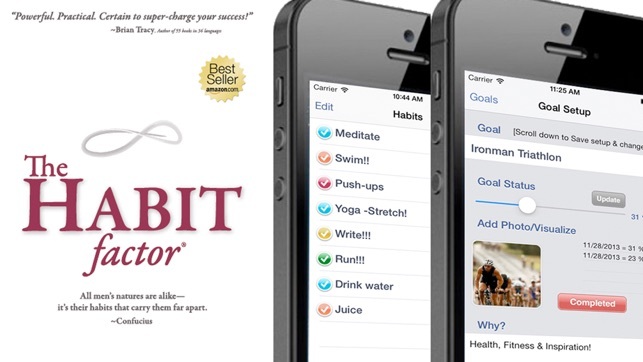 . . one must scroll through ALL of the habits EVERY day to check off the correct ones, but the app doesn't tell you which ones you're SUPPOSED to be doing that day. 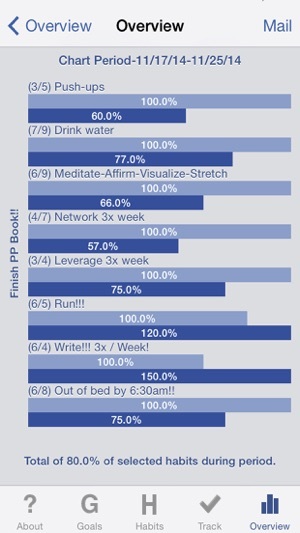 The programmers explain this by saying that you have the OPTION of doing each habit every day, which is true. But still, the only way of being reminded of what you're supposed to be doing is to exit the tracking screen completely and look into the details of EVERY SINGLE HABIT. Another weird thing is that the icon for this app shows up with a highlighted (red-circled) "9," which doesn't change no matter what I click in the app. One suggestion: I have some habits with the POTENTIAL of having to be done every day but may not have to be done. Examples: shipping packages for my web site and cleaning the kitchen. If I DON'T do them when they don't need to be done, it screws up the whole rating. I don't know how this would be addressed in the paradigm of the software. Another thought: This would be a more useful program if it contained regular to-dos, as well. As it is, I now have to look in two places to find out what I'm supposed to be doing. 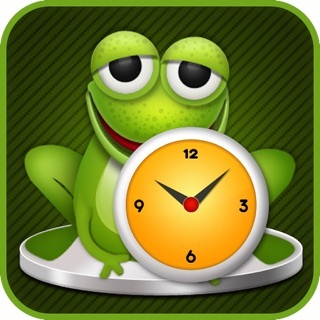 © 2009-2018, Equilibrium Enterprises, Inc.
Brian Tracy's, Eat That Frog! 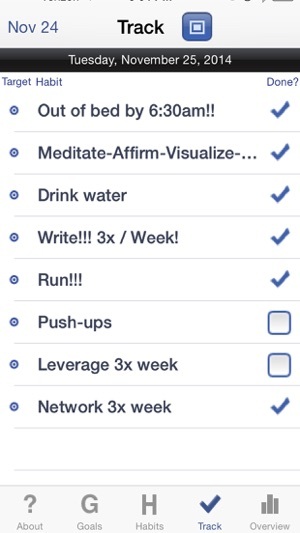 Daily Goals, Motivation, Productivity, Effectiveness & Focus!